Woodbrook Golf Club is perched on top of one hundred foot sea-cliffs, landscaped on all sides and steeped in history, Woodbrook offers a new challenge to today’s golfers. Leading new-aged architect Peter McEvoy has handsomely redesigned Woodbrook’s layout. The result being a course that sits comfortably alongside other rich new creations such as Mount Juliet, The K Club and Portmarnock Links. Eighteen new, sand based, bent grass greens of varying sculpture and built to a standard set by the USGA, combined with the cunning placement of fairway and greenside bunkers, call for shot making virtuosity of the highest calibre. The surrounding views are stunning with Bray Head, the Sugar Loaf, Killiney and the Irish Sea all within sight. 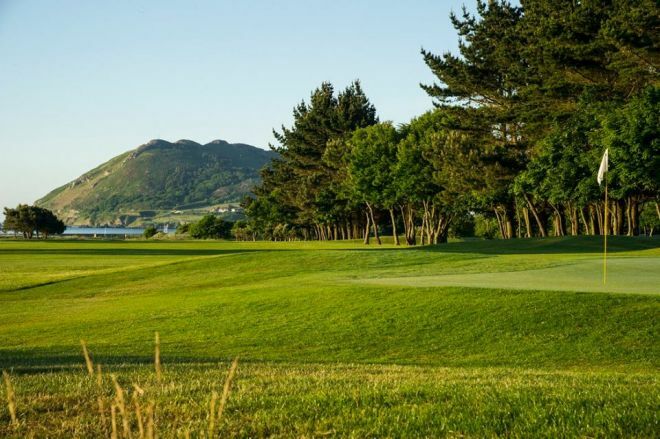 Woodbrook was the venue of the Carroll’s Irish Open for many years and was the venue of the AIB Irish Seniors Open Championship in 1998 and has staged many GUI Championships throughout its long history. Woodbrook has history, ambience and class. Golf and it’s high-tech equipment has outgrown it’s challenge...now I hope you agree that my design changes will prove to have redressed this balance and place Woodbrook on top of Irish championship venues". A proud Peter McEvoy. 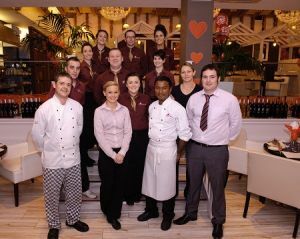 Woodbrook has a magnificent new Clubhouse catering for the golfers every need. Woodbrook offers members and visitors alike a friendly and challenging golfing experience to rival the very best available. The Ladies of Woodbrook Golf Club won the East-Leinster Final of the Junior Foursomes at Charlesland Golf Club on Sunday 3rd September 2017 when the beat Malahide Golf Club by 2½-matches to ½-match. They were led out by Gail Wolfe with Siobhan Ward who had a very comfortable 6 and 4 win over Ann Evans with Anna McGrath, in the second match Brigette Byrne with Susan O’Dwyer had a similar result against Louise Kelly with Anne O’Neill and the bottom match Ger Cantrell with Marcella Acton recorded a halve against Irene Magee with Paula Ryan when called-in. Paul McDonald won the West of Ireland Open Championship at Co. Sligo Golf Club on 13th April 2004 when he beat Greg Bowden of Hermitage in the Final. The Ladies of Woodbrook Golf Club qualified to represent their club in the International Finals at Myrtle Beach, South Carolina in December 2002, when they beat Ranfurly Castle Golf Club from Scotland, at Msnchester in October. The team was Liz Kinsella, Geraldine Magee, Marguerite Kennedy and Sue Phillips. Mairead McNamara, playing off a handicap of 5 won the Ladies section of the Chiquita Long Drive Challenge, when she drove the ball 238 yd‘s down the fairway at the first in Lucan Golf Club in September, 2000. Sir Stanley Cochrane of mineral water fame was responsible for the origins of golf at Woodbrook. An enthusiastic sportsman, he had first-class cricket facilities at his residences, where International cricket teams played before the Great War. Sometime after 1912, he had a private course laid out at Woodbrook, where he would entertain his friends. Brian Brooks-Alder, ho became his private secretary, introduced him to the game. Irish Life", on the 5th November 1920, gives the following account "A meeting was held at Woodbrook, Bray, on Thursday, at which it was decided to form the Woodbrook Golf Club. The rules submitted to the meeting were adopted and the following officers were elected: President, Sir Stanley H. Cohrane, Bart, D. L., Captain, Richard P. Pim, Hon. Secretary, and Treasurer, George Revell. The meeting appointed a committee and elected a number of members. The Woodbrook course is situated on a most favourable ground. It commands a glorious view of the sea and mountain. It is one of the longest nine-hole courses around Dublin. Woodbrook, no doubt, must be regarded as a proprietary course, but with such an enthusiastic sportsman as President, Woodbrook Club is certain to flourish." Woodbrook became an open club in 1926 and affiliated to the GUI in 1921, according to the 1928 Yearbook. A fine new clubhouse and improvements to the course were carried out in the late 1990s. Established in 1921, by Sir Stanley Cochrane as his private club, Woodbrook was first affiliated to the Golfing Union of Ireland in 1926. Sir Stanley had previously indulged his enthusiasm for cricket at Woodbrook, a fact that is still reflected in the pavilion-style clubhouse and the cricket bell, which tolled the start and finish of play and now hangs in the bar. However, it is as a venue for top class international golf, that Woodbrook is justly famous. Woodbrook hosted the first major professional Tournament in Ireland. The Hennessy Tournament in 1958. This once-off event, proved so popular amongst the Irish sporting public, that the following year it became the Irish Hospitals Sweepstakes Tournament with the then biggest prize fund 5,000 guineas. 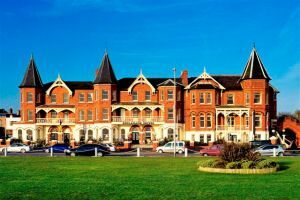 All the leading players arrived to play Woodbrook and International Tournament Golf in Ireland was born. In 1963 the Tournament that really established Woodbrook as a major golf venue began – The Carrolls International. Carrolls brought the cream of British European and, indeed, American golfers to play the fairways of Woodbrook in the ensuing years up to 1975. Many of today’s legends of Golf played the course. Some, as winners, like Christy O’Connor, Senior and Junior, Bernard Gallagher, Neil Coles, Brian Huggett and Bernard Hunt. Others, as rookies on the day, like Jack Newton, Eamon D’Arcy, John O’Leary and Sam Torrance. Superstars, like Open Championship Winners, Max Faulkner, five times winner Peter Thompson, Gary Player, Tony Jacklin, Tom Watson and Ken Nagle all delighted the larger Irish galleries. Anybody who was anybody, in the history of British and European golf from 1963 to 1975, appeared at the Carrolls in Woodbrook. The Irish Open had been discontinued in 1953, having run almost continuously since 1927. Carrolls revived this great Irish Title in 1975 at Woodbrook and the modern Irish Open was born. This is now an integral part of the European PGA Tour. An all-star field, including the British Open Winner Tom Watson, played for the first Prize of £5,000 and the inaugural winner was Ireland’s Christy O’Connor Junior, nephew of the great Christy O’Connor Senior, himself a four times winner of the Carrolls International. Trains have always played a major part in Woodbrook’s history. In olden days the Dublin-Bray train stopped at the club and in the early days of Tournament golf, spectators alighted on the course. Up to 1956, when members wanted to go home, they pulled a switch in the club house bar and the next train, to pass along the way, stopped for two minutes to pick up those who were travelling to Bray or Dublin. Alas! Today, such hospitality is unavailable, but on six holes, the spectre of the DART and the railway line looms large for the wayward driver. Where the wind has sculpted the trees. Although a flat course, "Woodbrook", as Christy O’Connor, Senior put it "may look easy, but it is a very difficult course, with the constant threat of out of bounds and other hazards that can wreck your card". In this regard the wind plays a most significant role. When it blows from the North, nine holes are affected, including three out of the last four. When it’s from the South, the index one tenth plus the par three eleventh, and the par five – 12th, 14th and 16th, all become very difficult long holes. A crosswind from the East affects almost every hole on the course and calls for shot making of the highest calibre. With its configuration of five par threes and five par fives, Woodbrook’s layout is unusual but, in the opinion of those who have played there, it is a championship course in every meaning of the word. Recently redesigned, with three new holes and 18 sand based greens, built to USPGA standards, Woodbrook is once more a challenge for the best. The club has hosted 18 major international championship events, a record unlikely to be surpassed, and numerous Irish Professional and Amateur Championships through the years. The staging of the AIB Sponsored Irish Seniors Open in the club in 1998 completes a remarkable journey for many of those stars of yesterday, bringing them back to the fairways they once graced so well. Woodbrook is unique in Irish Golf, with its heritage and tradition, ambience and atmosphere and the quality and layout of its course. For members and visitors alike it represents a challenge to be met weekly or just occasionally, but always enjoyably.